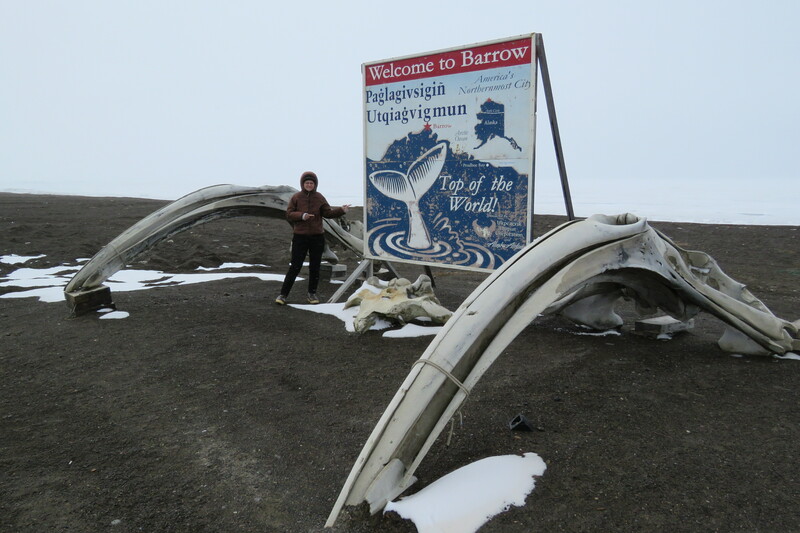 Jack and I decided to venture to the top of the world, that is the most northern community in Alaska and thus the United States – Barrow Alaska (Ukpiagvik in Inupiat). 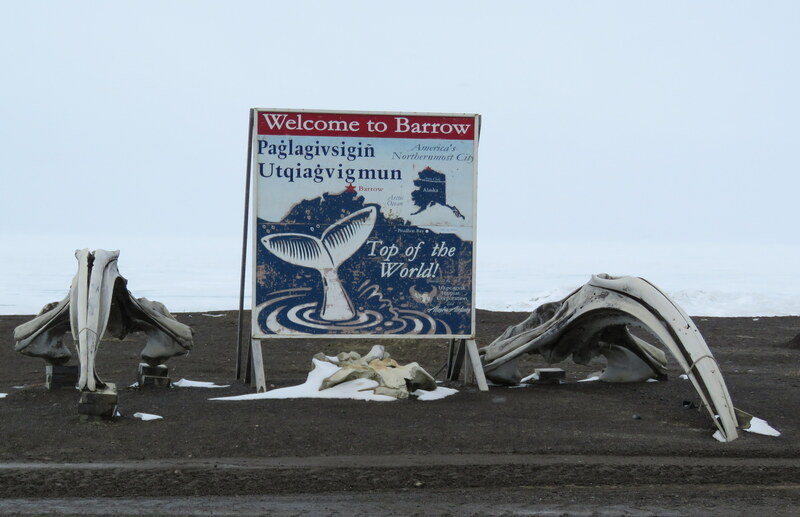 All 4,700 people call Barrow home while surviving 330 miles above the Arctic Circle (they have a natural gas field nearby so stay warm). We arrived to cold temperatures (low 30s), snow, and strong winds (gusts to 30+ mph) around 11:30 am. 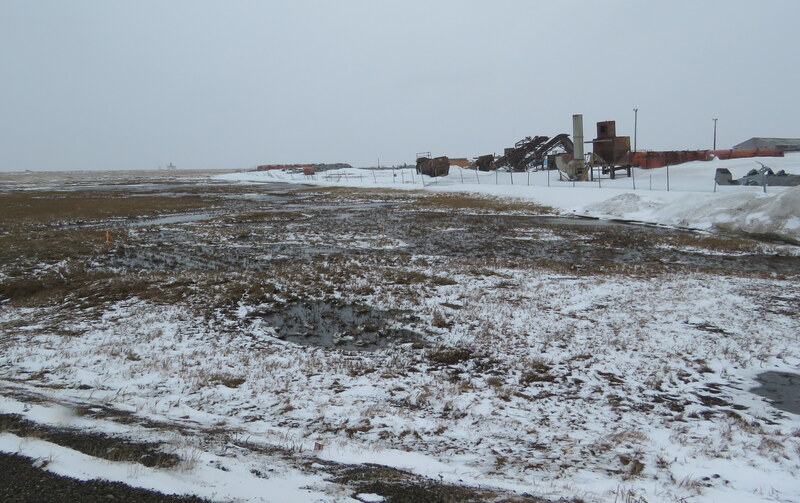 On the way, we made a quick stop at Prudhoe Bay – think oil filed workers – before flying on to Barrow. 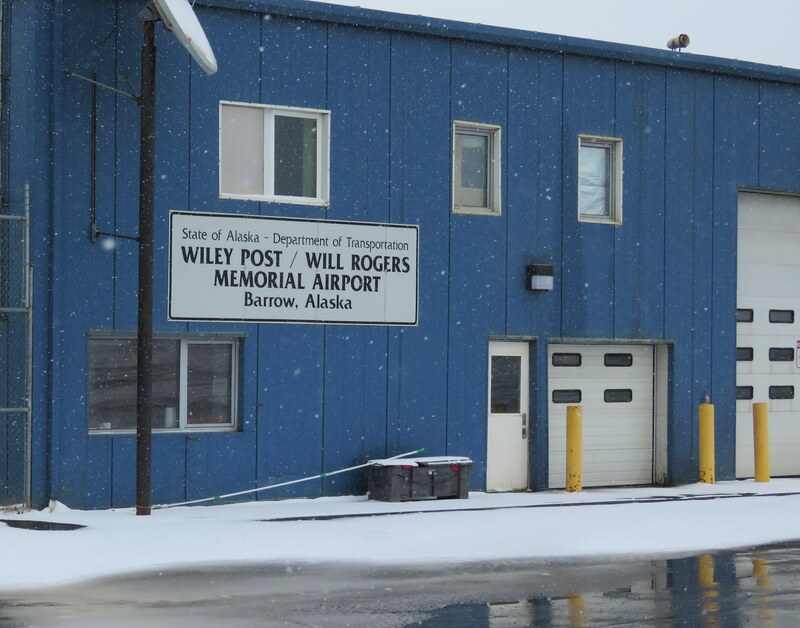 As I waited for our baggage to arrive (s0 much for the 20 minute rule guaranteed by Alaska Airlines), Jack went to pick up our rental vehicle for our three day stay – a 4wd pickup truck. 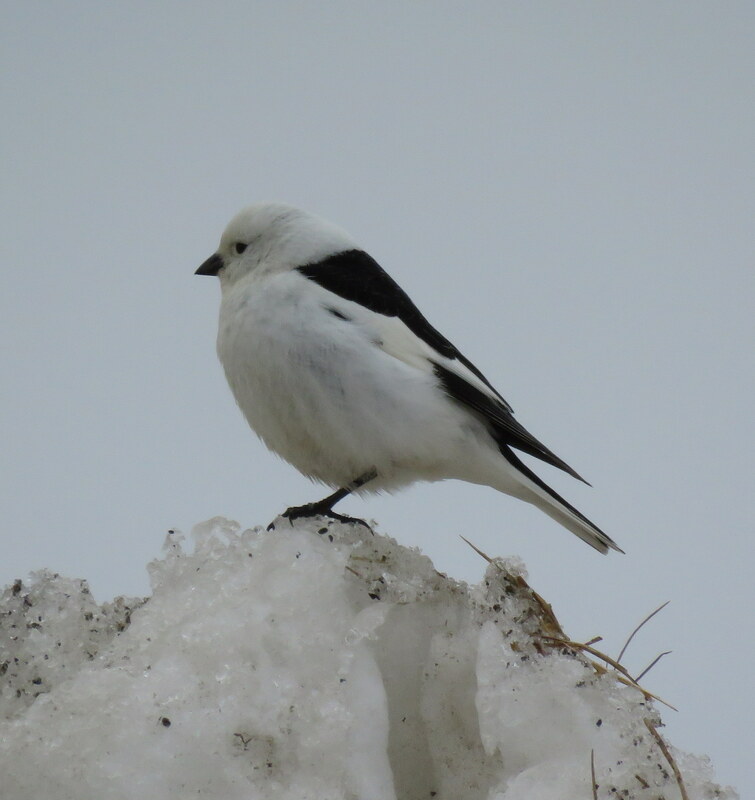 We then checked into our hotel (Airport Inn), changed into warm clothing, and immediately braved the wind and cold to go birding – over 185 species come here to breed and continue the cycle of life. One nice benefit from our early season arrival was almost no mosquitoes yet! 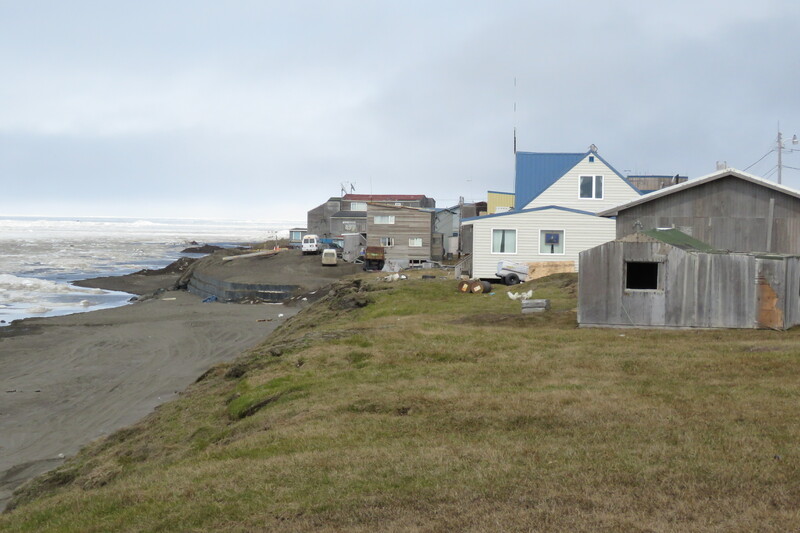 There was still a fair amount of shore ice so no polar bears roaming the town but also no bowhead whaling yet. 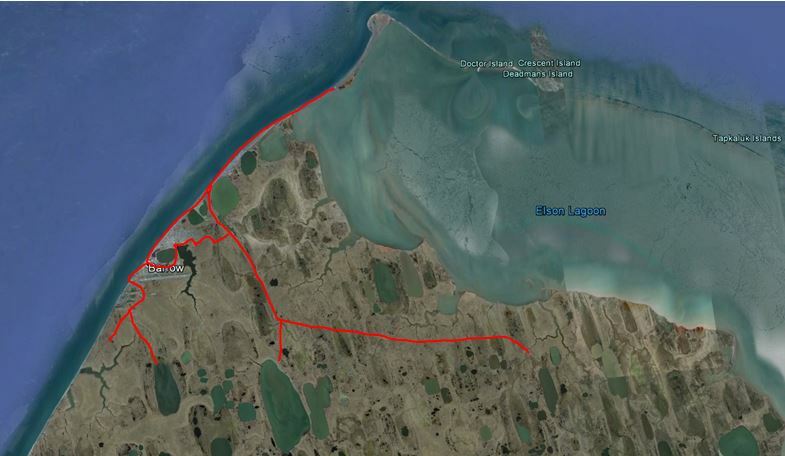 Google view of the Barrow area. Red lines show the roads we traveled. 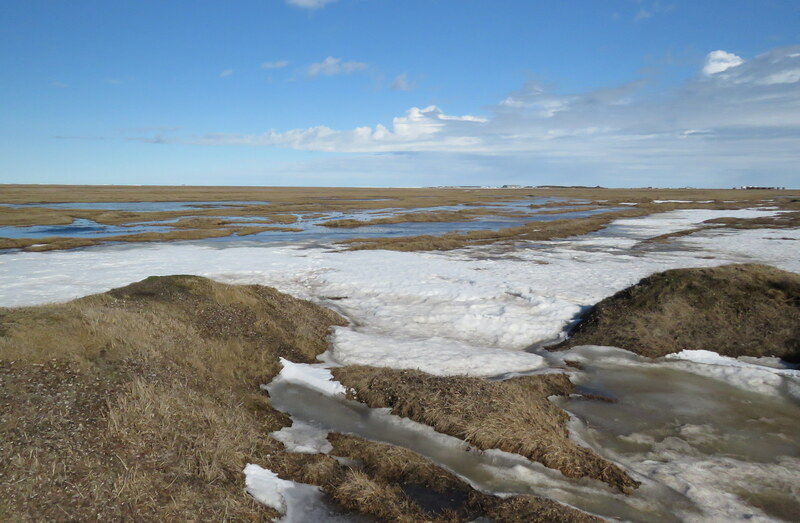 The roads were variable as far as conditions go in the Arctic – surprised to find gravel roads when you are surrounded by wetland permafrost tundra. The road out to a birding hot spot – Freshwater Lake, required 4wd as there was one spot near the cemetery that was quite muddy, okay a mud pit suitable for a mud buggy. 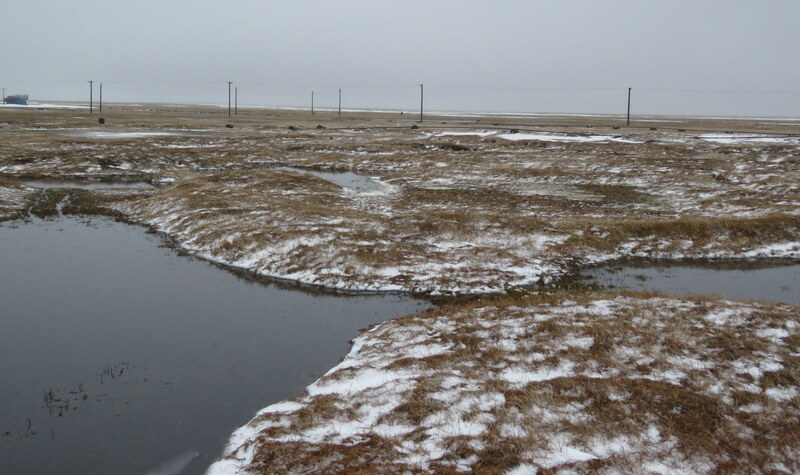 The habitat of the area as you can see from the aerial photo above is flat treeless tundra with many lakes and ponds. Many of the larger lakes were still frozen over. I suspect with the 24 hours of daylight and warmer days the lakes will thaw quickly. We noticed a big difference in the amount of snow cover just in the three days were were there. 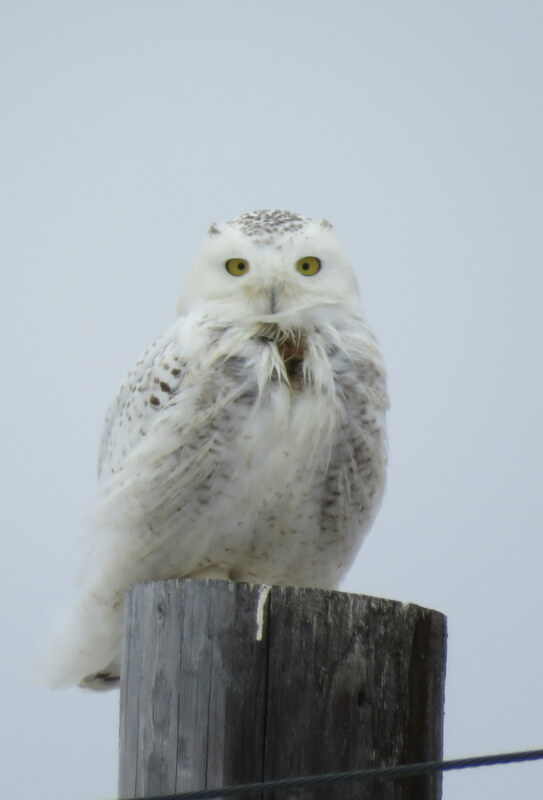 Imagine birding 24 hours straight? Although you could bird here 24 hours (the summer sun never truly sets ), we did not. The area has few roads and we drove them all several times during our stay. Each day proved to be different from the next as to where the birds would be found. 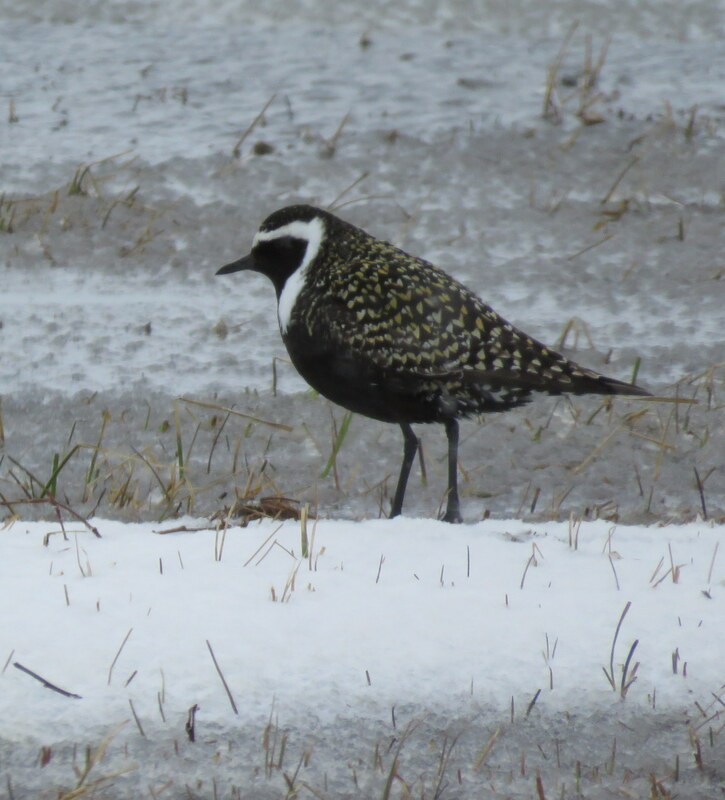 On our arrival with such nasty weather we had a lot of shorebirds hunkered down in the ponds along Nunavak Road. This was our most productive area for the day. 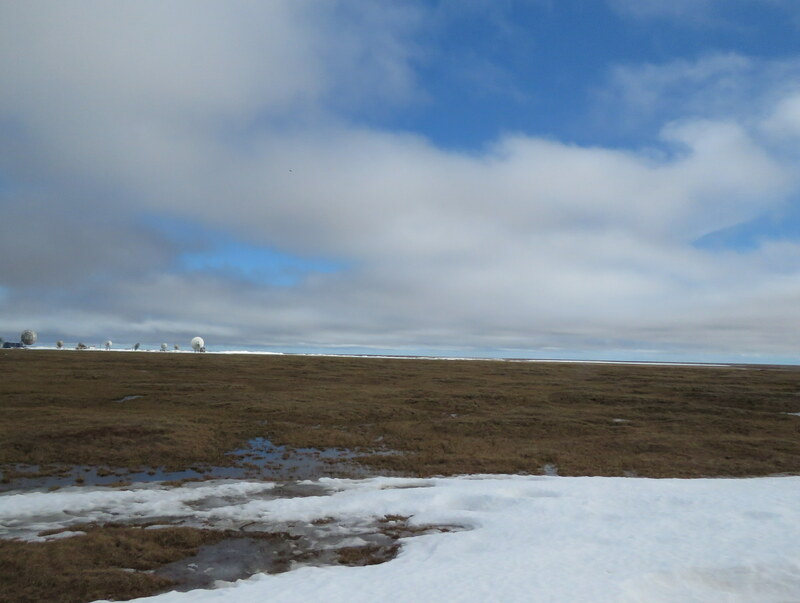 As you can see from the photos below, there was still a lot of snow on the ground when we arrived. When we went back to this area the next two days, we didn’t have the same level of bird activity as we did the first day. Could the fact it was snowing and nasty weather have made a difference? We think so. Phalaropes are a fun shorebird species to watch with their unique feeding behavior. They go round and round in the water in a dizzying display to stir up food. 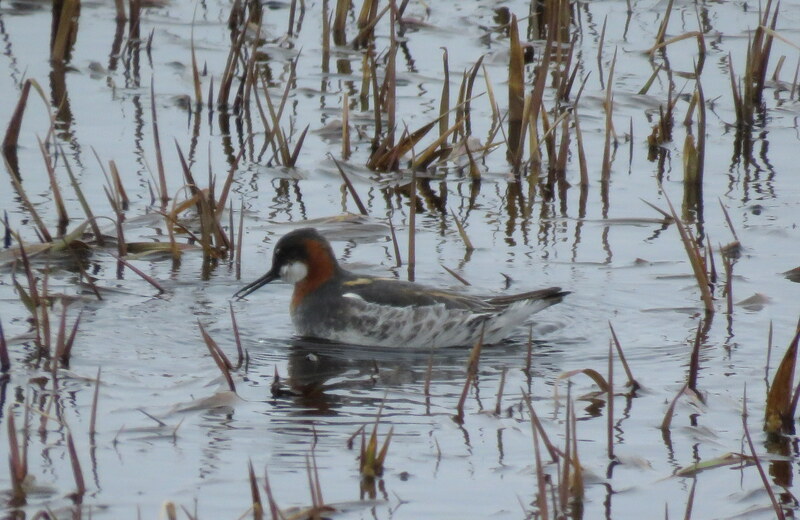 We noticed that Red Phalaropes, while they do still swim in circles to stir up the invertebrates, don’t quite circle with the same intensity as the Red-necked Phalaropes. 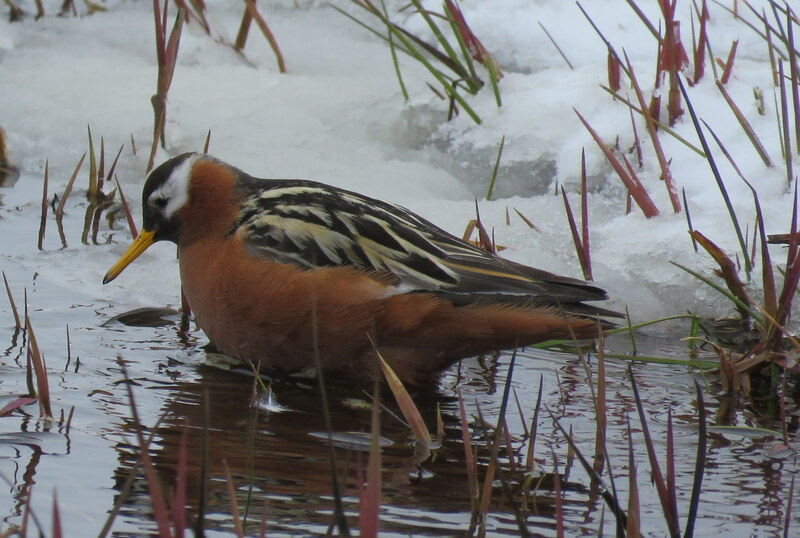 And the female Red Phalarope is actually the more striking of the the pair. We first noticed this when we saw a pair trying to mate (when all else fails check the bird book…). 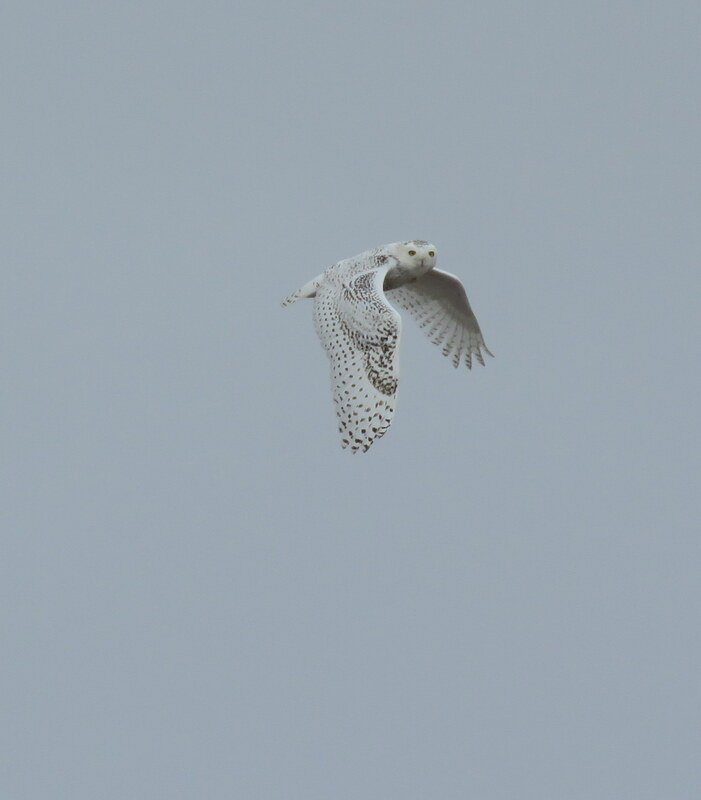 I love these birds in flight. Their wing pattern against their red body is very striking. 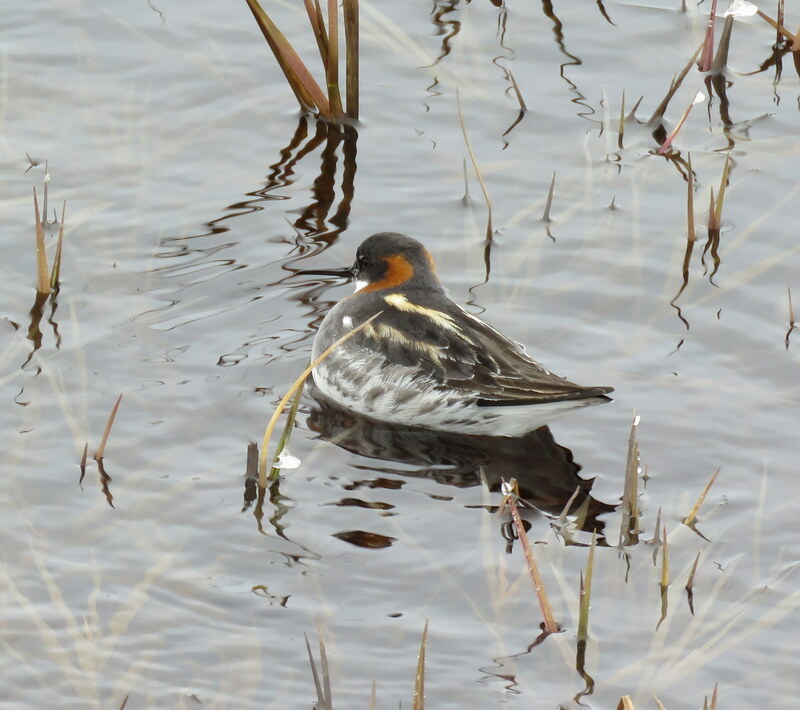 The Red-necked Phalaropes were everywhere the first two days. However, once the sun came out on our last day we didn’t see as many. It was fun to watch them swim around and around and around and around in tight circles in search of food. I was able to capture one on video. 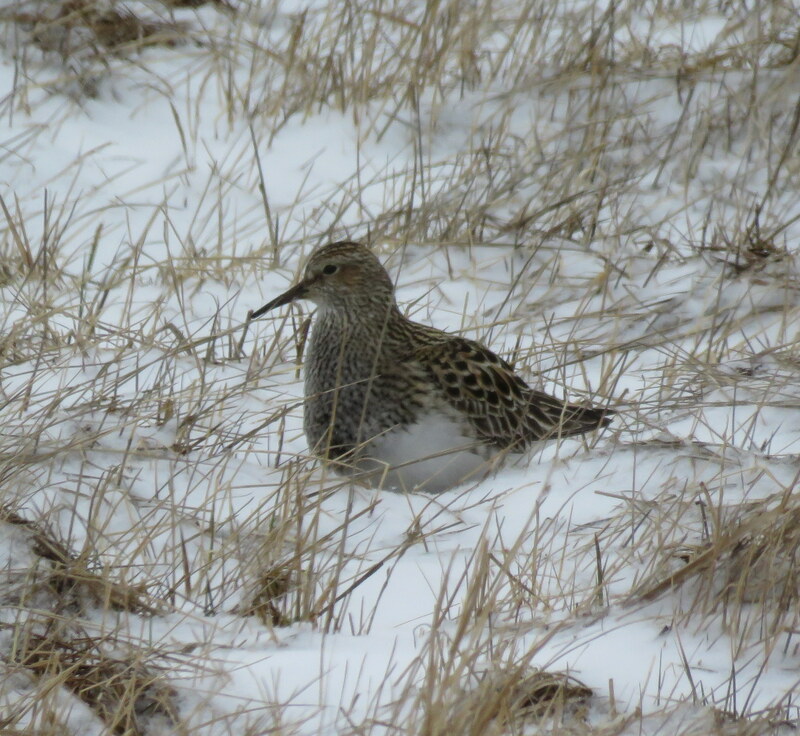 Pectoral Sandpipers were the most prevalent shorebird. They were “EVERYWHERE”. We always knew when a male was chasing or trying to attract a female. The males inflate their throat sac which expands and contracts during display flights and you hear this wonderful deep echoing sound. 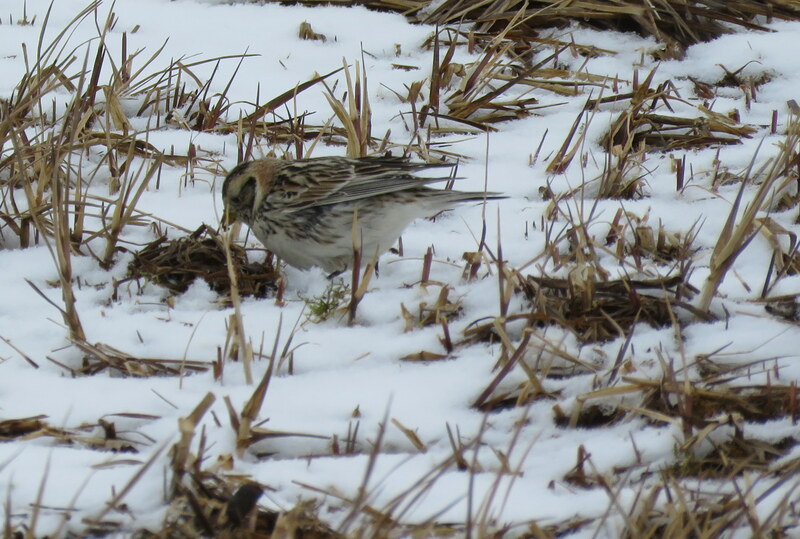 The Laplund Longspur (or as we started calling them “lappy”) is a common bird in Barrow during the summer. They offered a great show as we watched them fly up into the air (almost straight up) and then gently float their way down carried by the wind on a glide path. 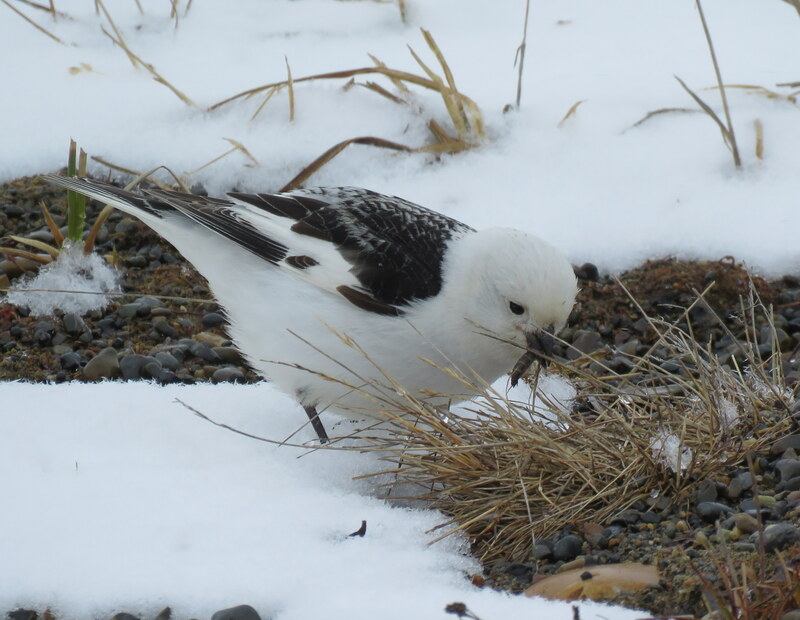 The Snow Bunting is also a very common bird in Barrow. 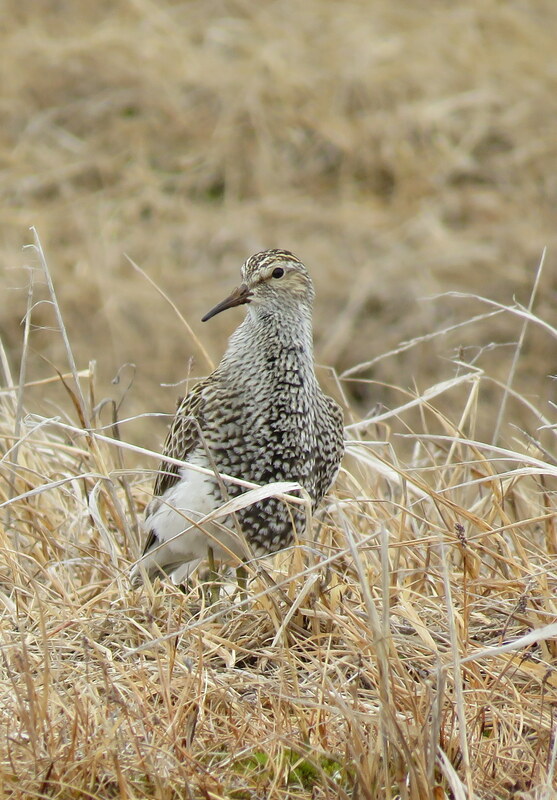 It became a favorite bird to see – they seem so elegant. I guess the locals like them also since we were told that people have nest boxes for the birds. You find them all over town, on top of buildings and exploring the many junk yards when not on the ground feeding. 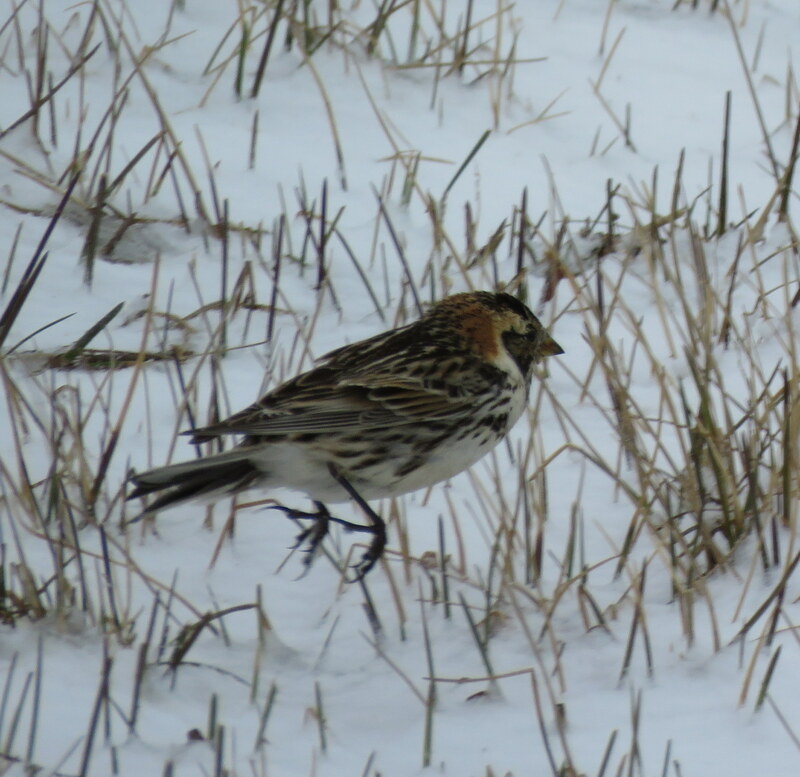 In addition to Lapland Longspur and Snow Buntings, other songbirds observed included Savannah Sparrows, Common Redpolls, and a lone Orange-crowned Warbler. 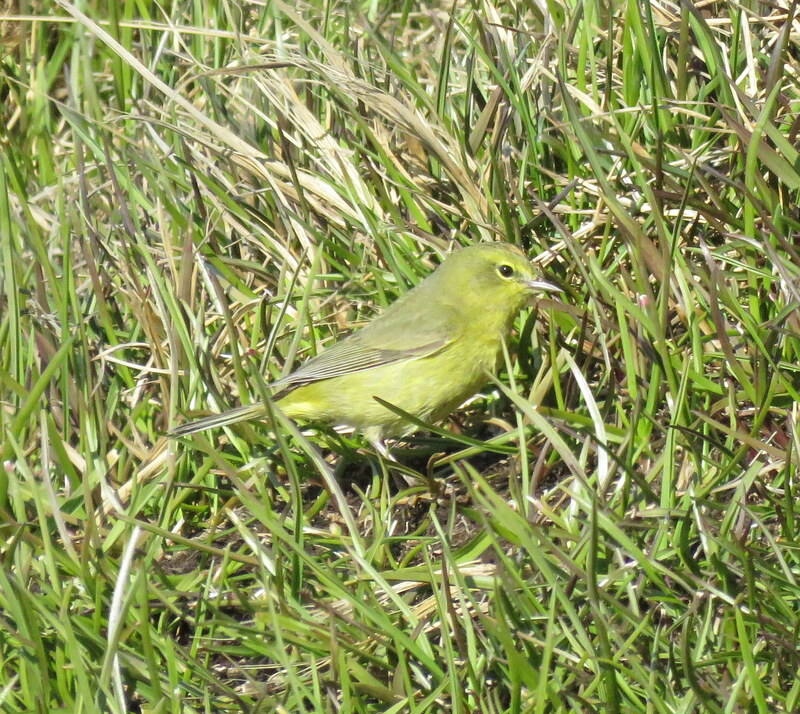 The warbler, not very common to this area, was observed along the bluffs near the boardwalk. 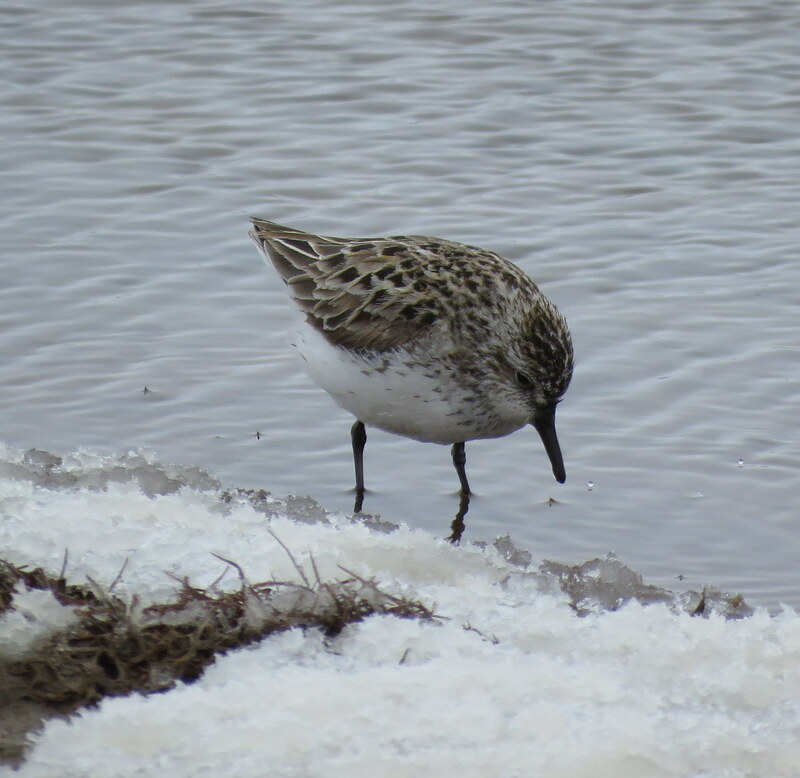 We also saw a fair number of shorebirds besides Phalaropes and the Pectoral Sandpiper. 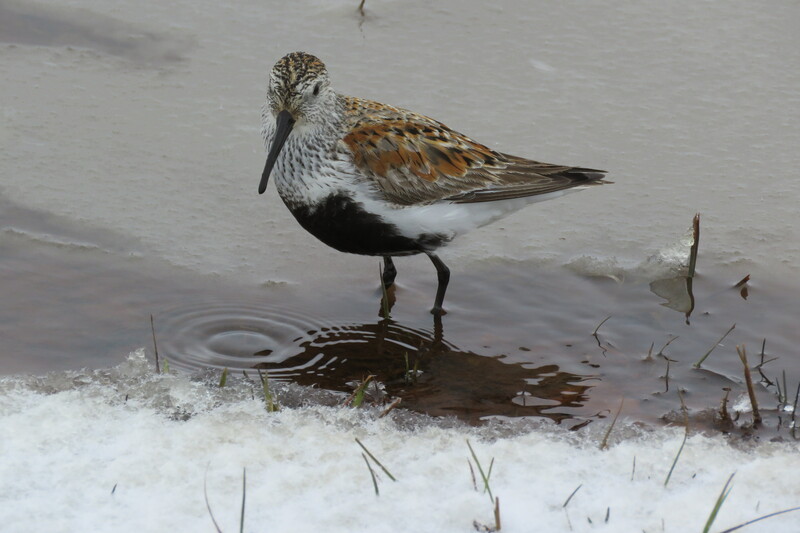 The shorebirds that come to Barrow for the ‘summer’ are truly amazing “hardy” birds (Jack calls them ‘wing warriors’) to fly so far and arrive at a time when there are still winter conditions. 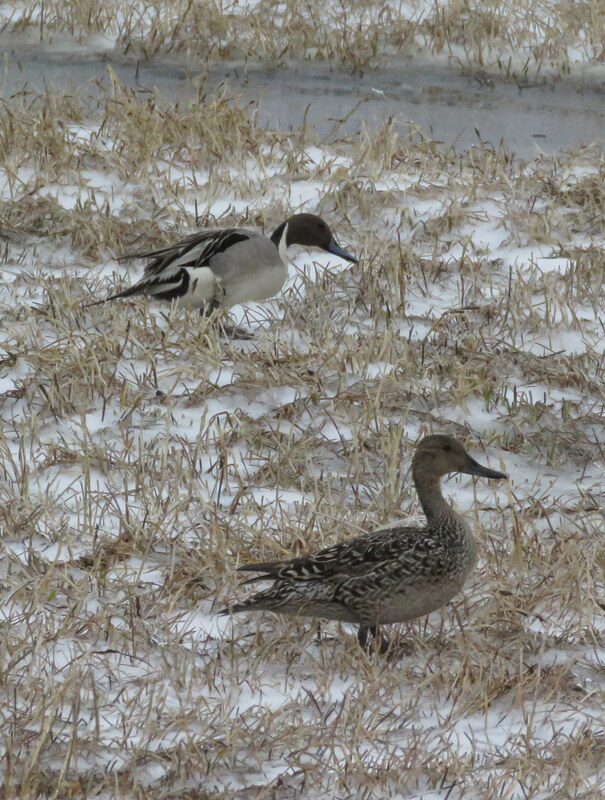 There were a fair number of duck species too, with the Northern Pintail being the most prevalent. 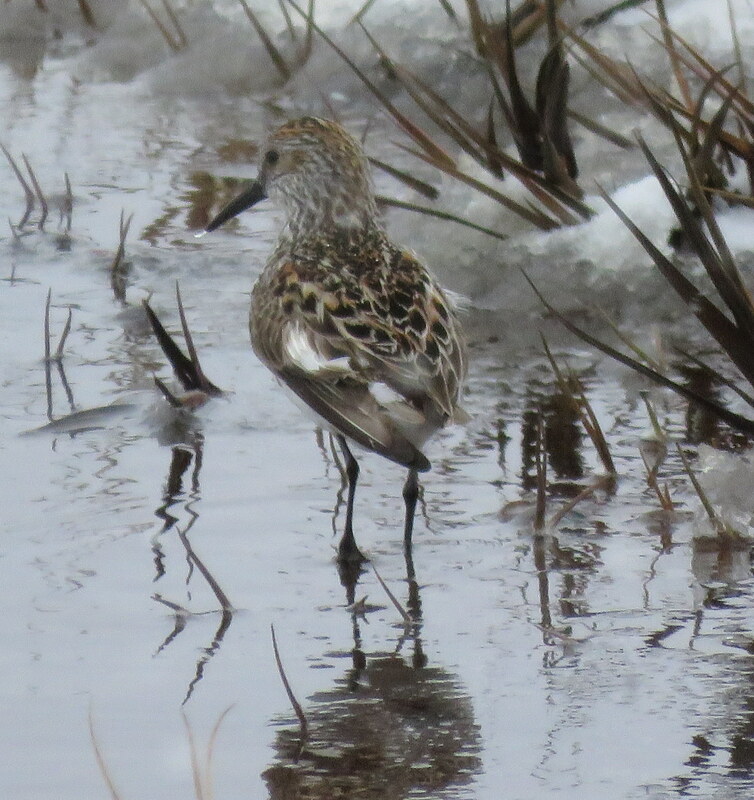 These birds seemed to be as prevalent as the Pectoral Sandpiper. 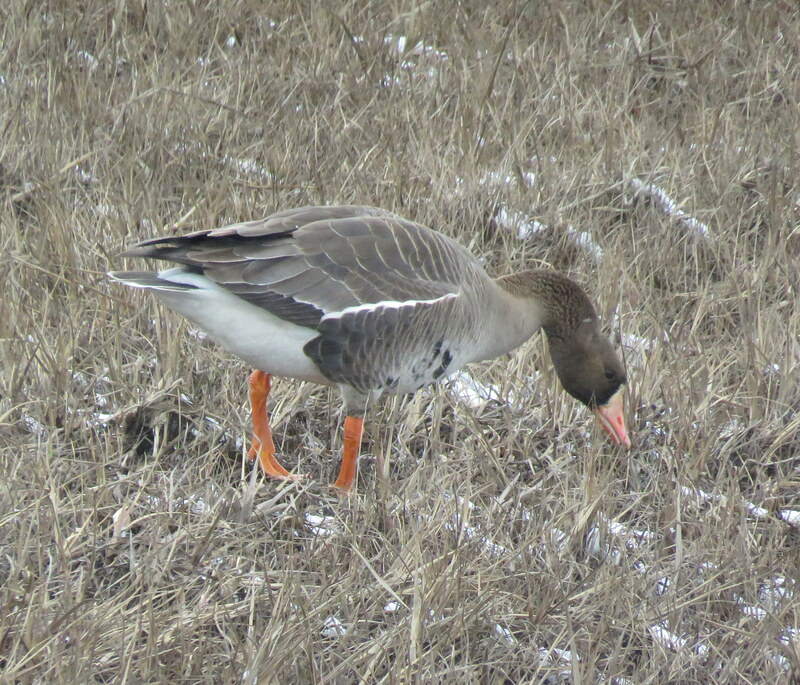 The Greater White-fronted Goose was present throughout the area. The first day we only saw a few, but by the second and third day the numbers had increased substantially. 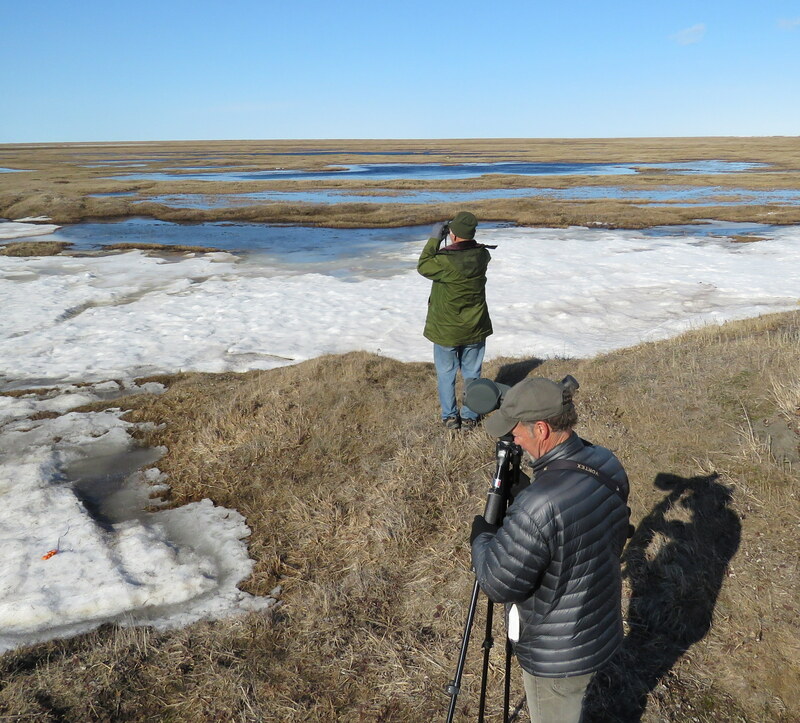 When we were walking on the tundra checking lakes in search of a Yellow-billed Loon (did not see one), we practically stumbled across a nesting Greater White-fronted Goose. 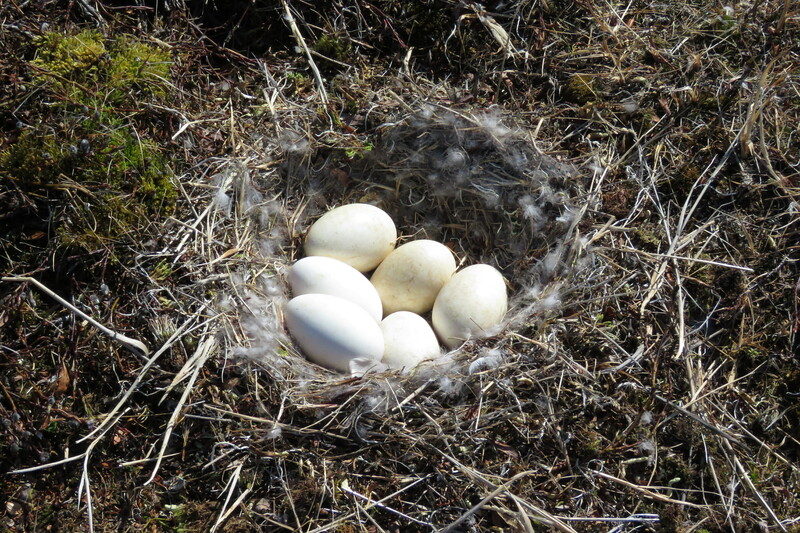 The photo below is the nest that was temporarily abandoned while we were nearby. I quickly took a photo and we continued on our way – mom returned. 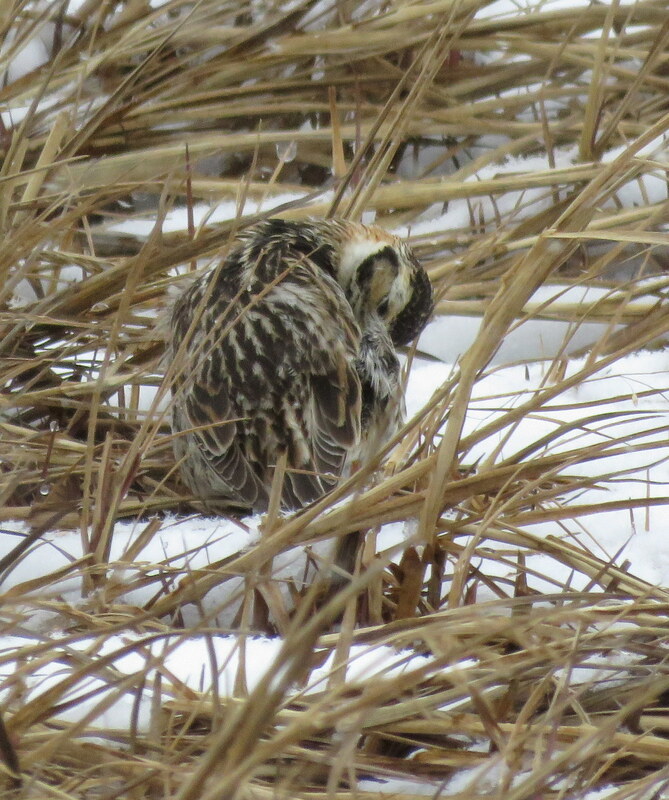 With so many predatory Jaegers about (mostly Pomarine), we didn’t want the parent to be off the nest for too long. 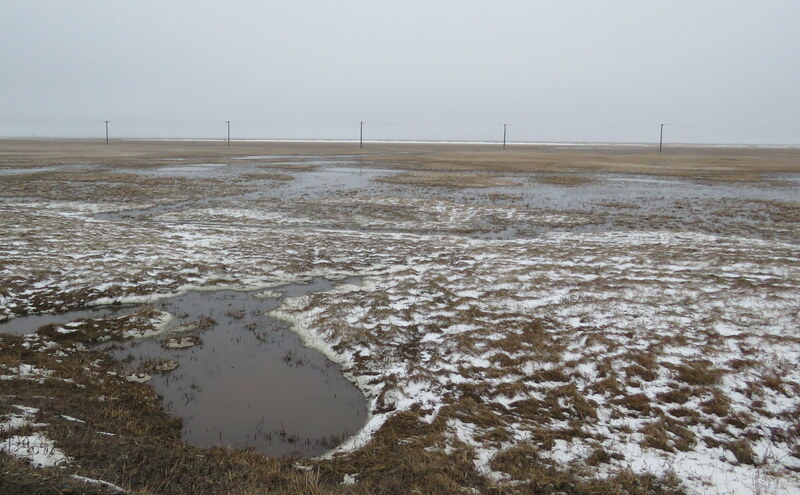 We saw several flocks of snow geese fly over, but none on the ground. 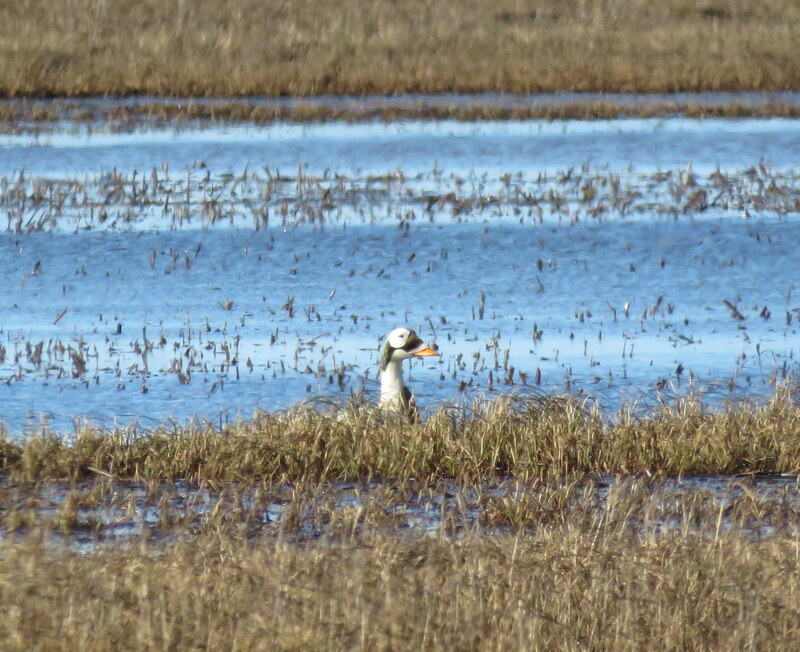 Tundra swans were present on the tundra and it was strange to see them away from water. The main purpose of going to Barrow for me was to see all four Eider species. We were successful in that endeavor! 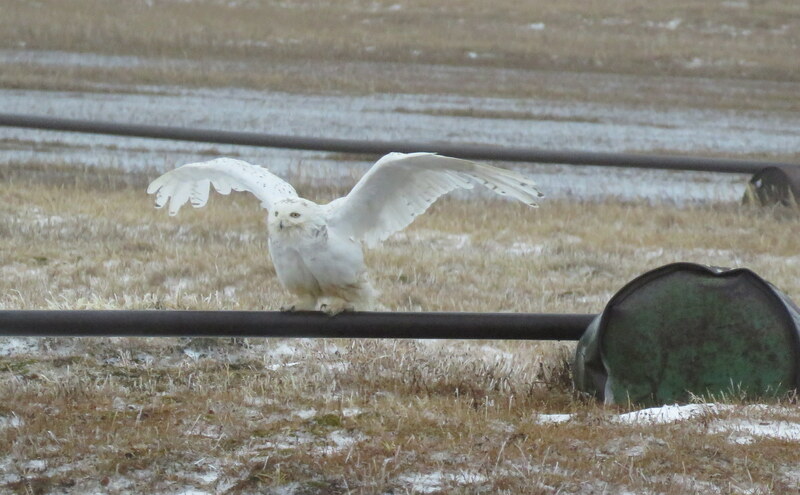 The main purpose of going to Barrow for Jack was to see a Snowy Owl. He got his wish too! 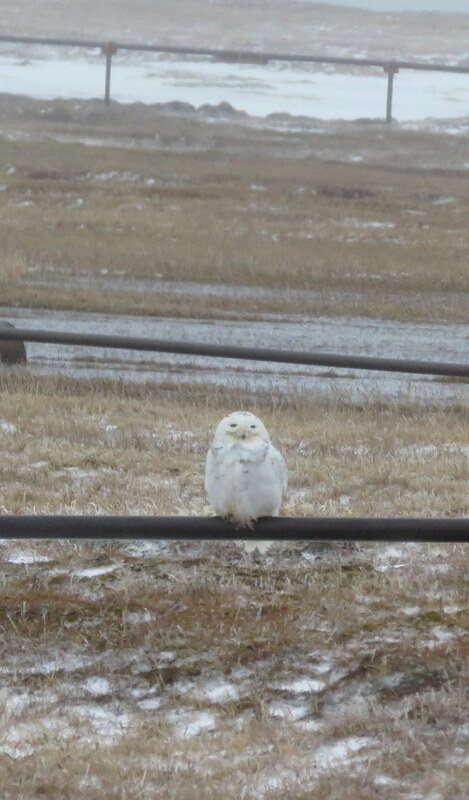 We saw at least two different Snowy Owls. 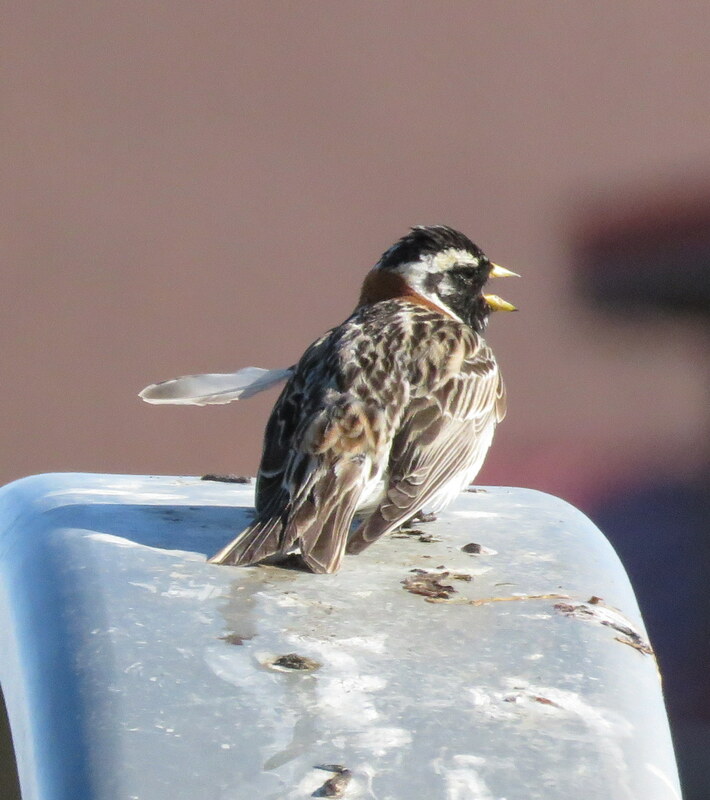 One was perched on a railing, while another was on an electric line. Both were beautiful – almost mystical birds. Our first sighting of an eider was on our second day. 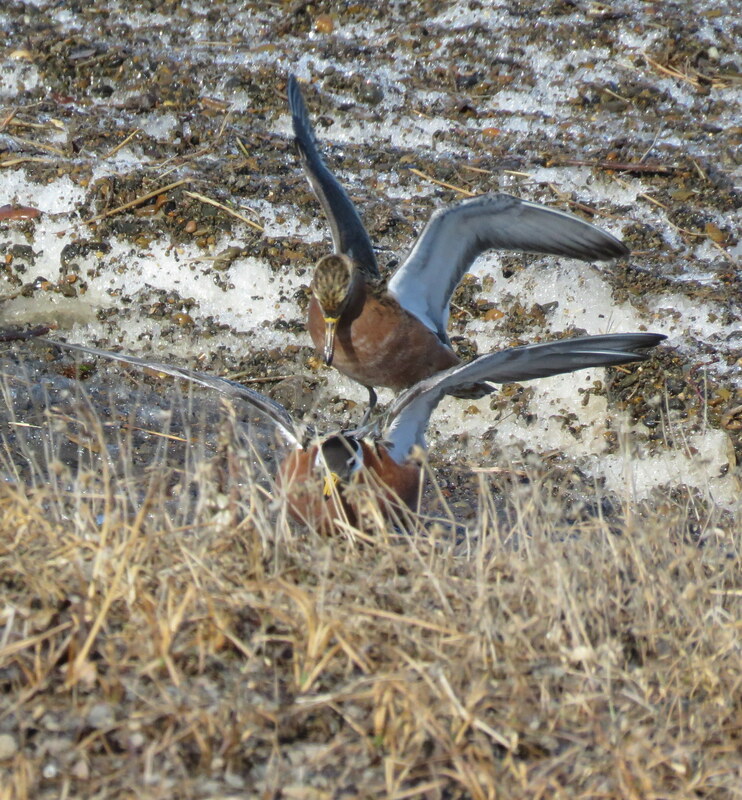 We were traveling down the road towards Ikoravik Lake when we flushed a King Eider pair from a pond. The male bird flew right by Jack’s window. Hard to miss that bird. 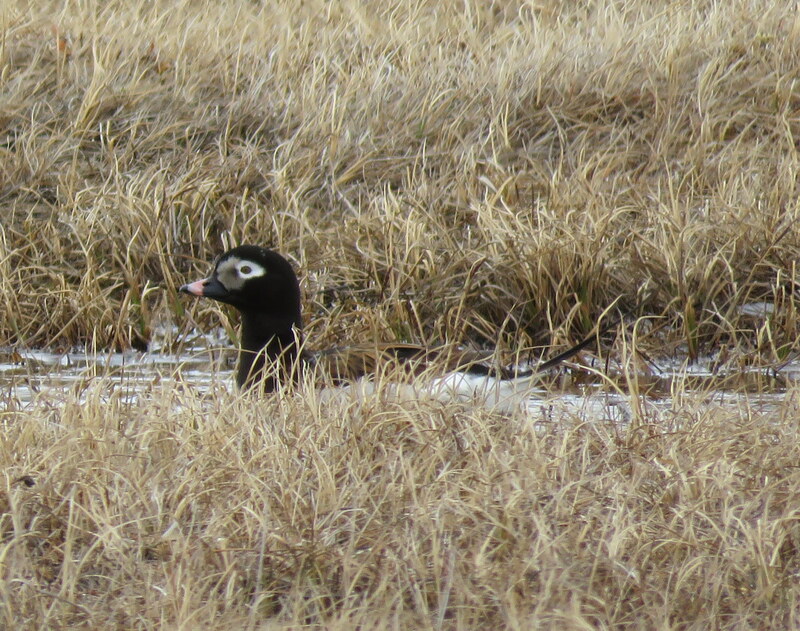 We later found the pair on a pond. 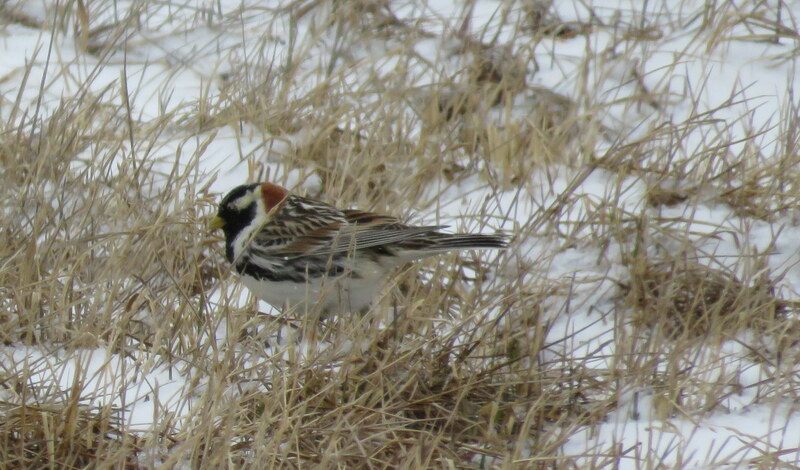 We saw another male the next day at a pond near Freshwater Lake. Both these areas were great places to bird. 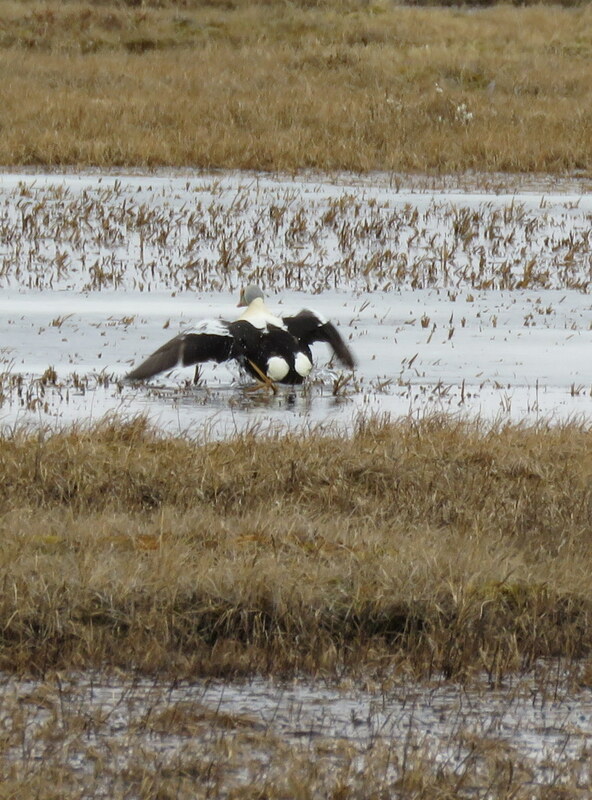 Common Eiders were only observed in flight along the Beaufort/Chukchi Sea. We saw several flocks of 50 or more birds flying east. 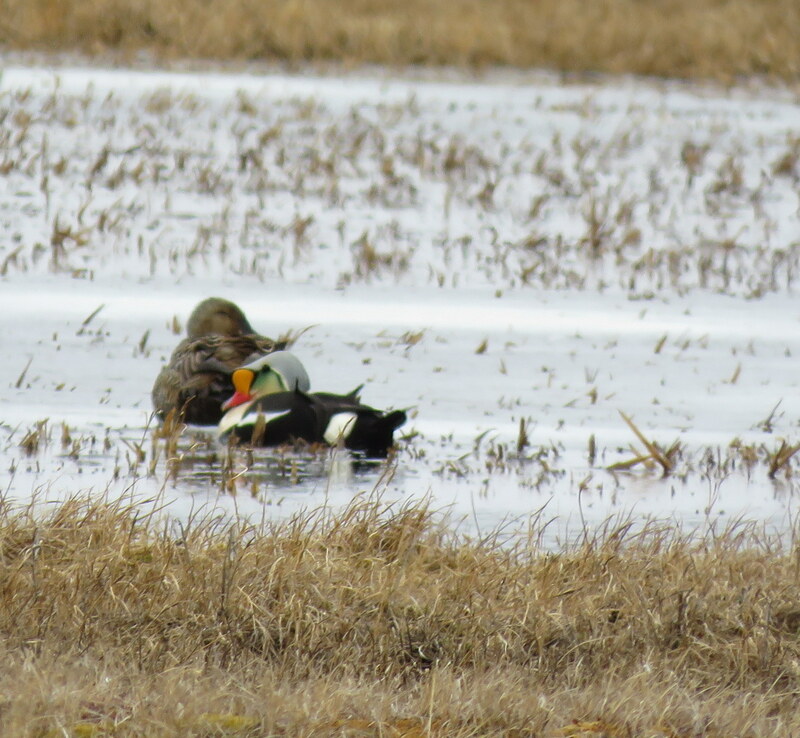 Of the eider species we spotted on the ground, we actually saw more Steller’s Eiders than King or Spectacled. On our last day near Freshwater Lake we finally saw a Spectacled Eider male. What a beautiful bird. 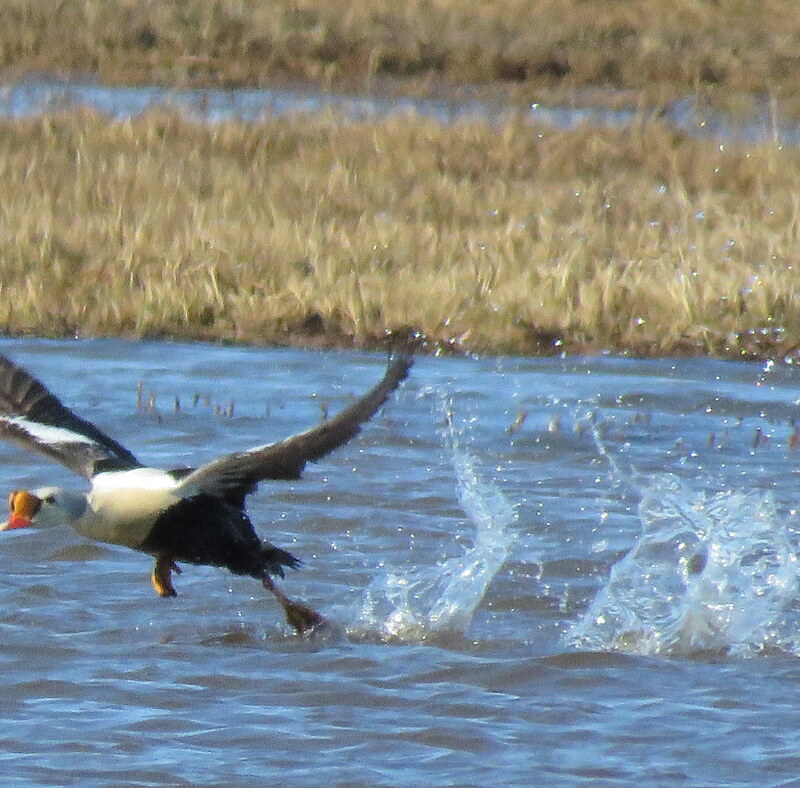 But then again, all the eider species are striking. On our last day we met John from Germany. 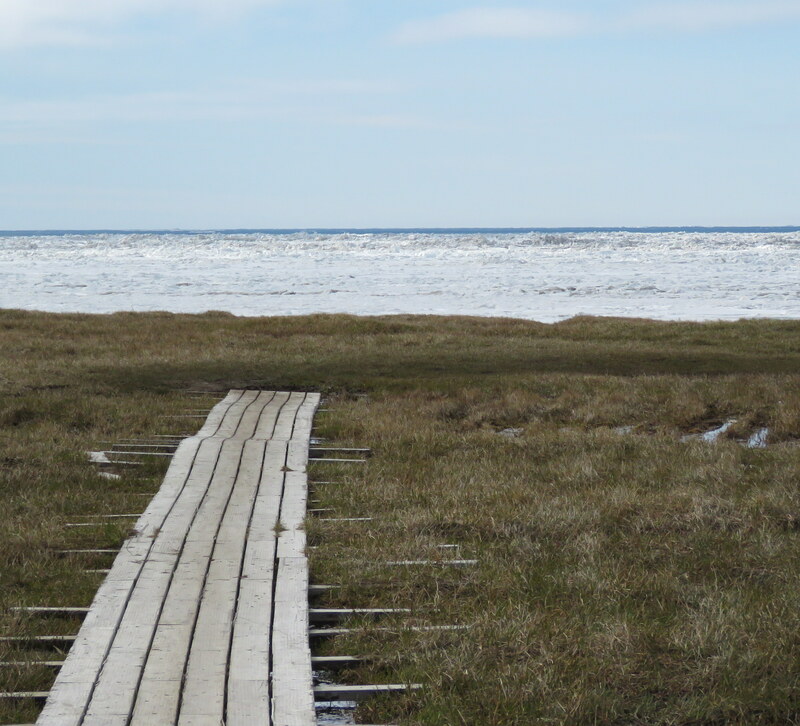 He was an older birder who showed up in Barrow hoping to find a Yellow-billed Loon. He didn’t rent a vehicle and had been birding on foot for several days. We invited him to join us on our last day. 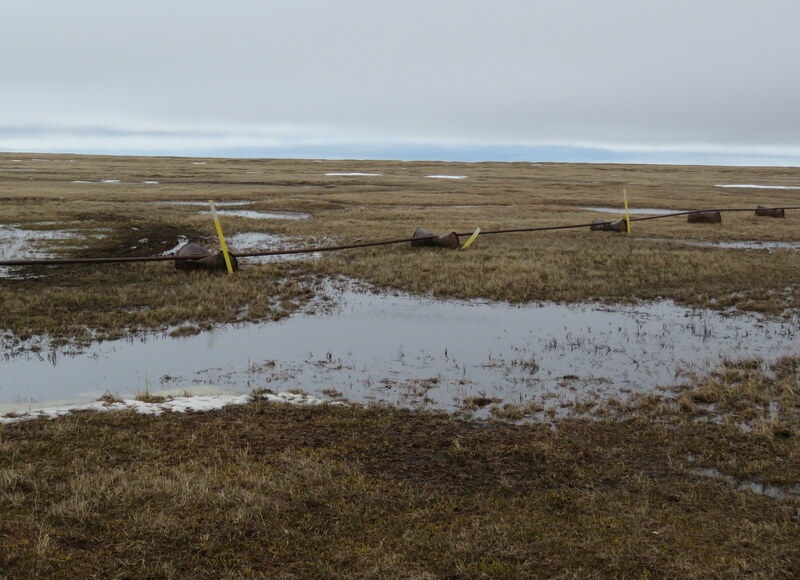 While we had our xtra tuff boots to negotiate the very wet, cold tundra, he only had hiking boots, and well used ones at that. And no warm socks. 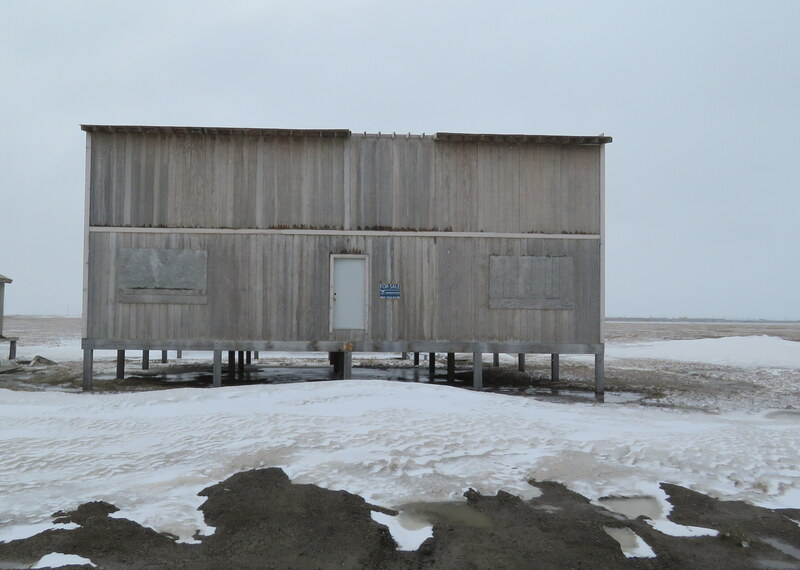 We had gotten a permit to be able to walk beyond the road system ($150) so we ventured out a short ways from the road looking for eiders, loons, and other birds. Poor John’s feet got wet, but he didn’t seem to mind. Luckily our last day was sunny and the wind wasn’t at strong. John was a good sport. We stopped once at the hotel so he could change socks. 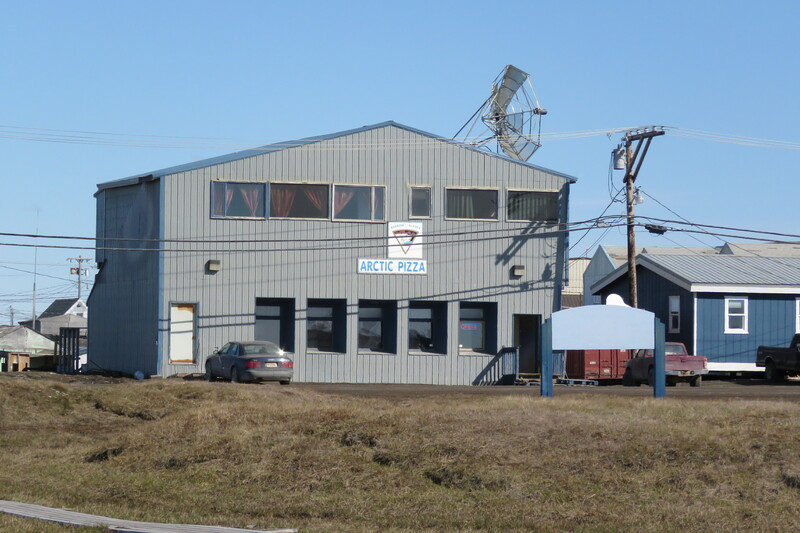 John’s next stop was Unalaska. Besides birds, we did check out the town and some of the environs. 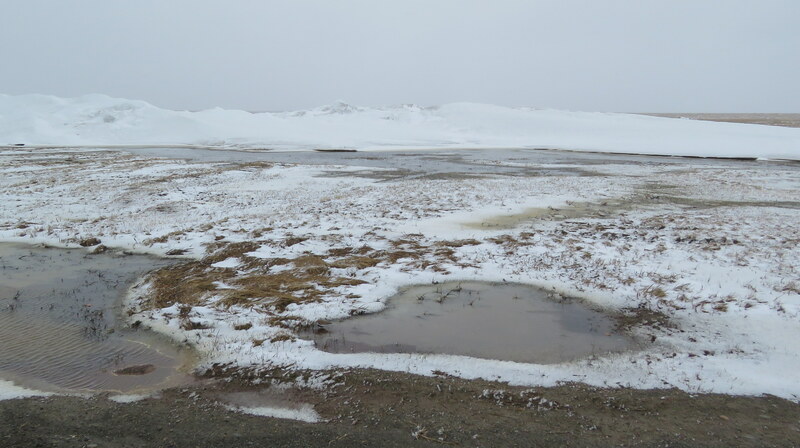 As you can see, there was still a lot of snow on the ground in places. 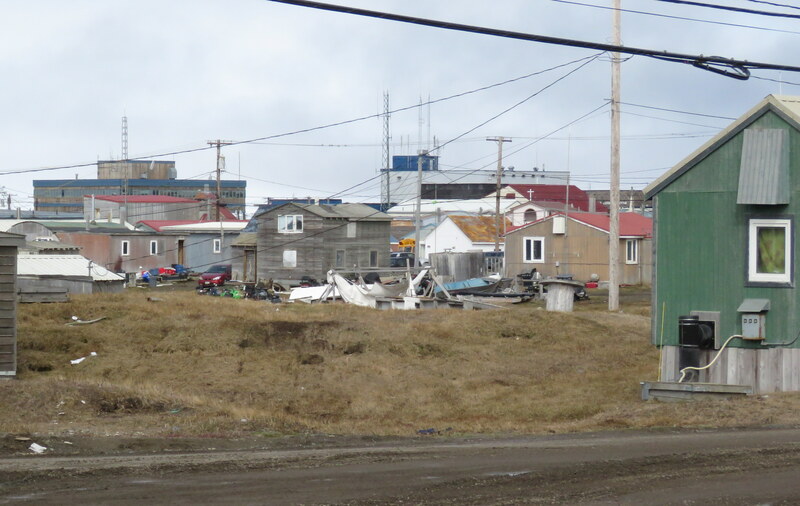 I told Jack that you can tell which families have lived in Barrow the longest by the number of dead vehicles in front of their homes. 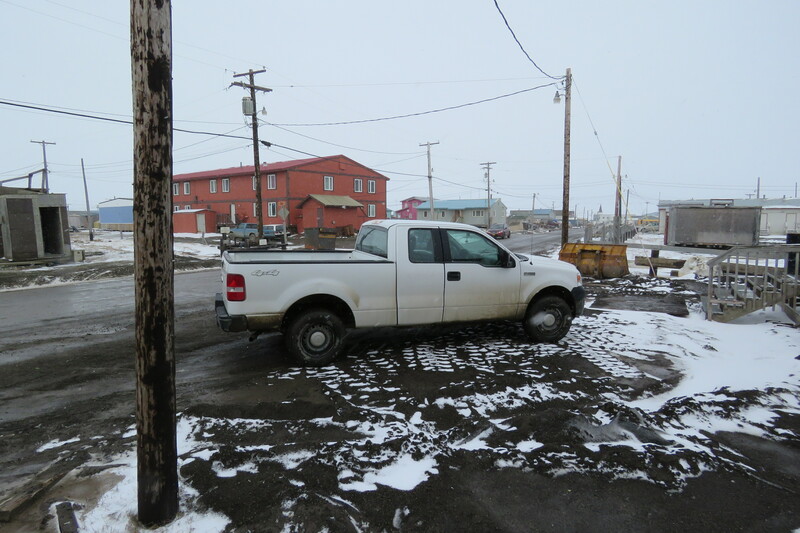 The more dead vehicles (cars, trucks, atvs, snow machines), the longer they have resided at that location. 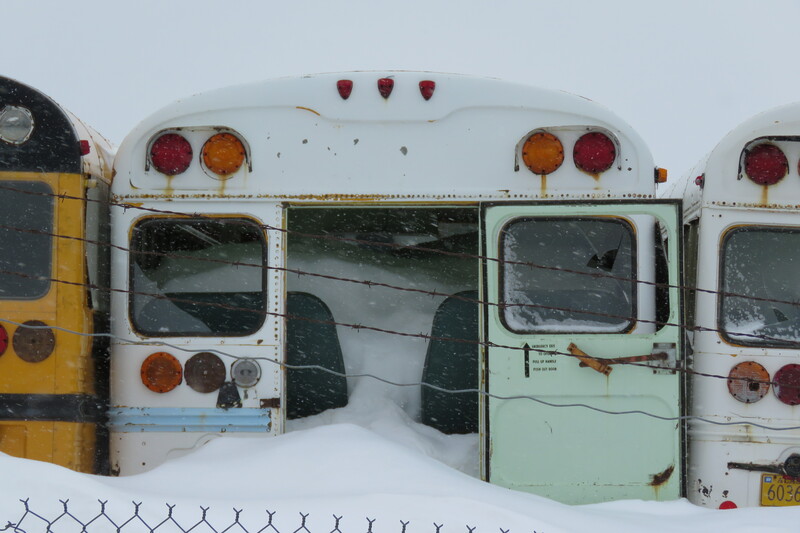 The community really needs a vehicle graveyard. 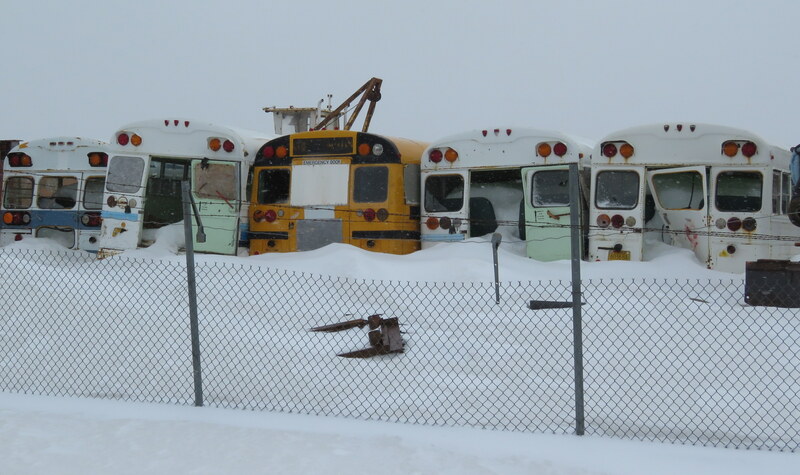 The buses above are no longer in use (at least I hope not). There were even a few places for sale. 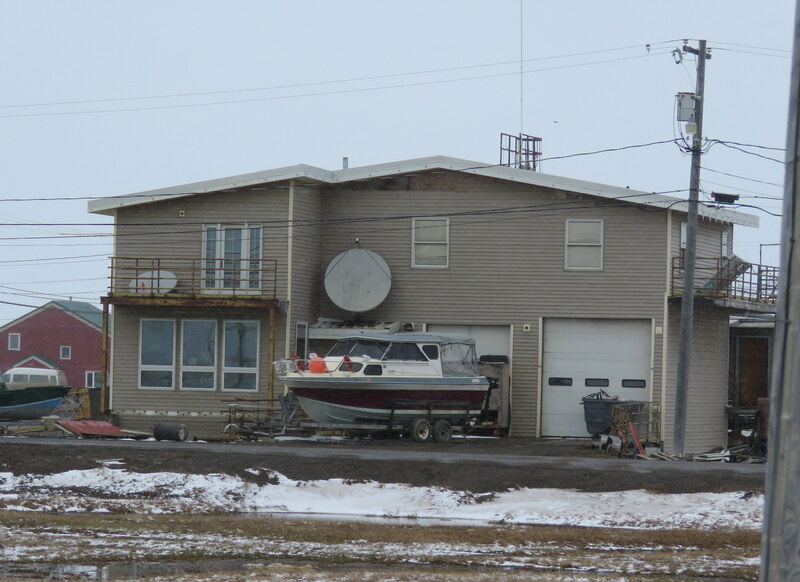 I wonder what this home was selling for??? And believe it or not, we did see a few trees. Not sure how they got there or whether they are alive or not …. 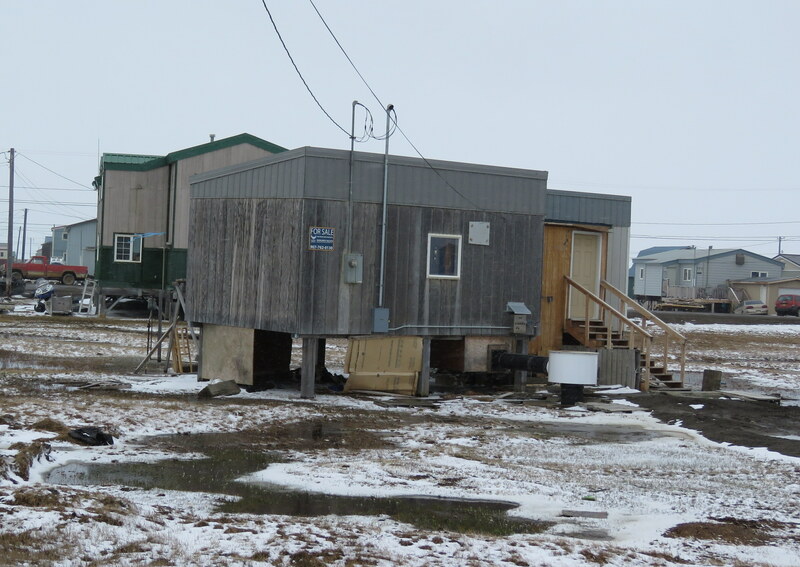 There are a few restaurants in town, including the Arctic Pizza place. There was a sign inside near some stairways that lead up that read “No children or teenagers allowed”. Hmm. I wonder what goes on upstairs? 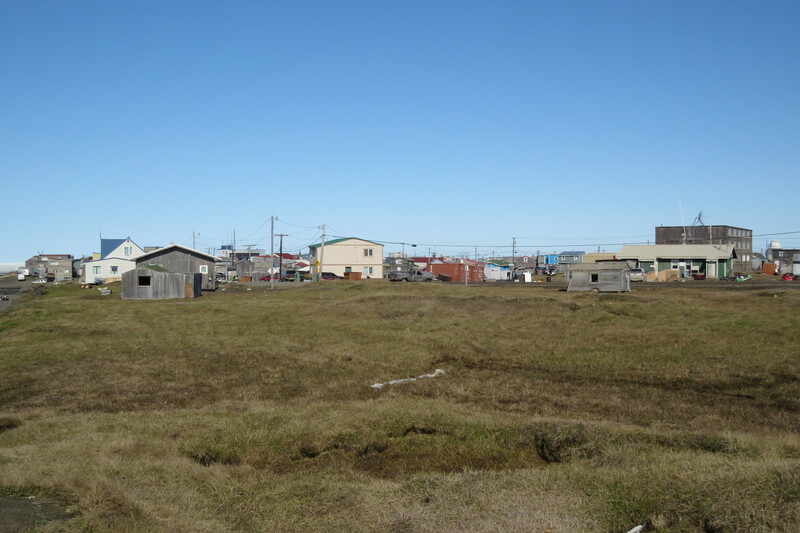 Barrow is a “dry” community which means no alcohol. 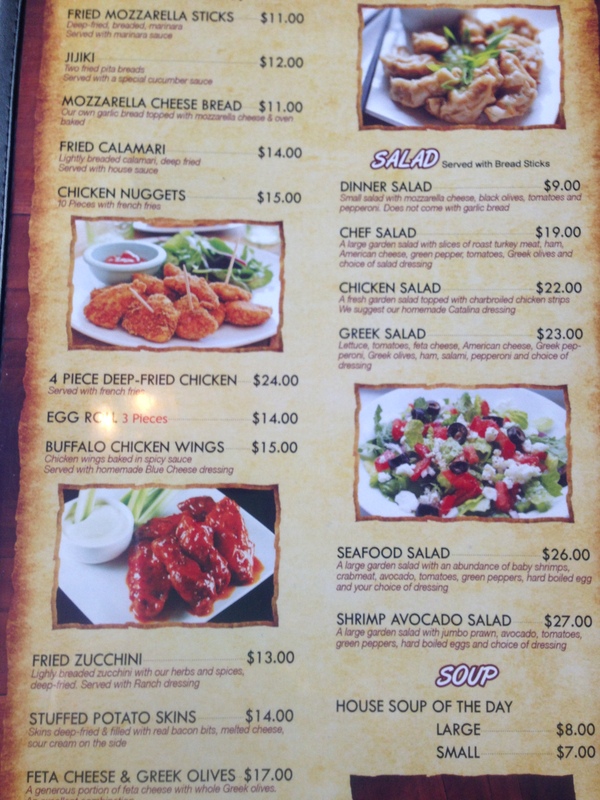 At the restaurant you could get pizza, of course, as well as typical American food (hamburgers, sandwiches), Chinese food, and Italian pasta dishes. This was the only restaurant that we visited so we cannot tell you about any others. The pizza was good. 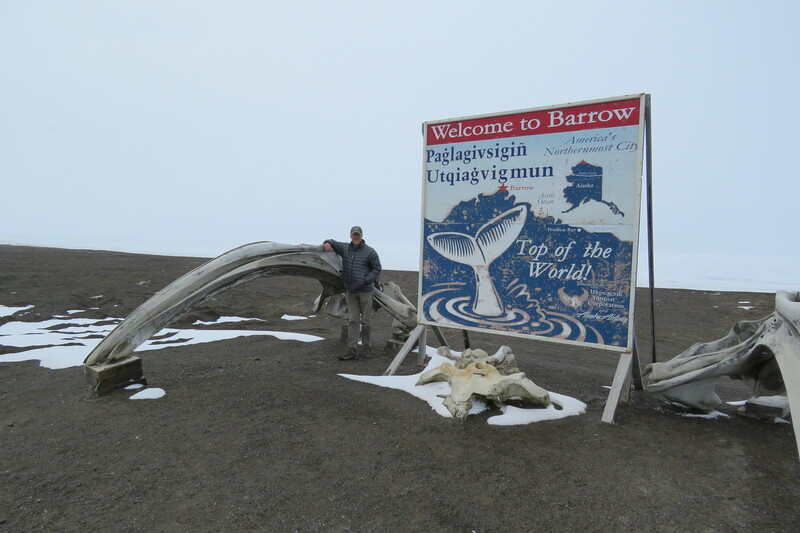 When in Barrow one must stop at the “Top of The World Sign” and get their photo taken, which we did. 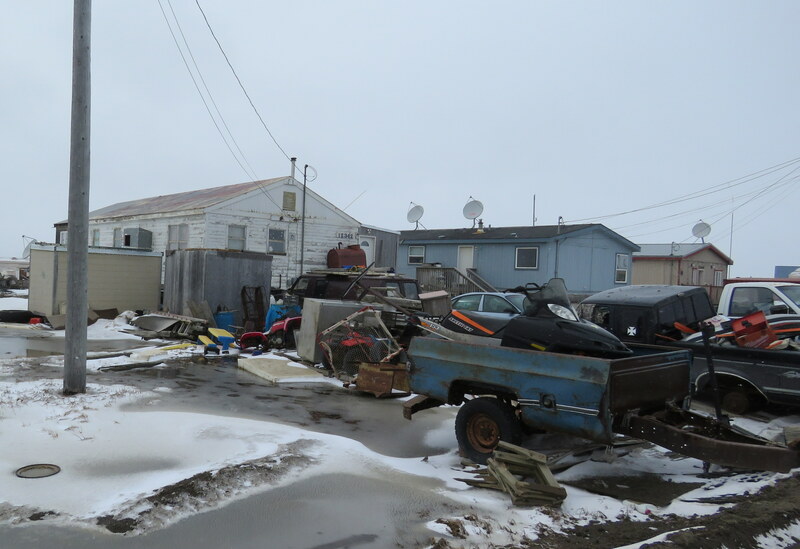 Many Alaskan villages remind me of cities and communities you might find in third world countries. The living conditions are some what primitive. With no roads to Barrow all supplies come via barge or air. Gasoline to refuel the vehicle when we left was $7.00 per gallon. 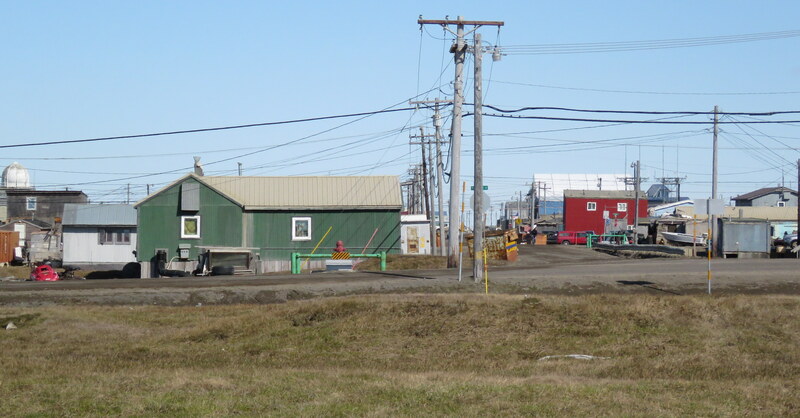 Since Barrow only gets fuel once per year, they pay whatever the going rate is when the fuel arrives. With prices now lower, hopefully they will be able to save on gasoline for their many vehicles. 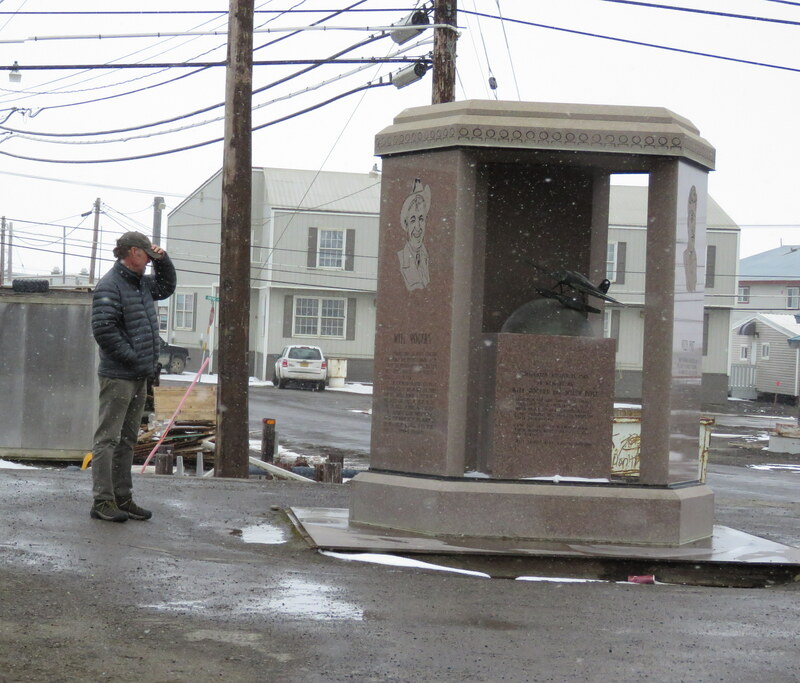 Jack participated in at least one cultural activity – he checked out the monument for Will Rogers who died in a plane crash near Point Barrow in 1935. 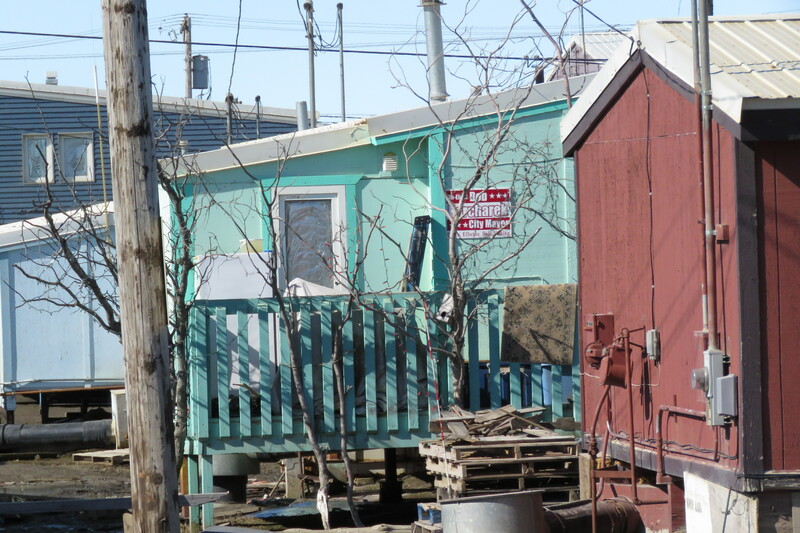 In Barrow there are dumpsters everywhere. However, despite the many dumpsters there was still a lot of trash on the ground. 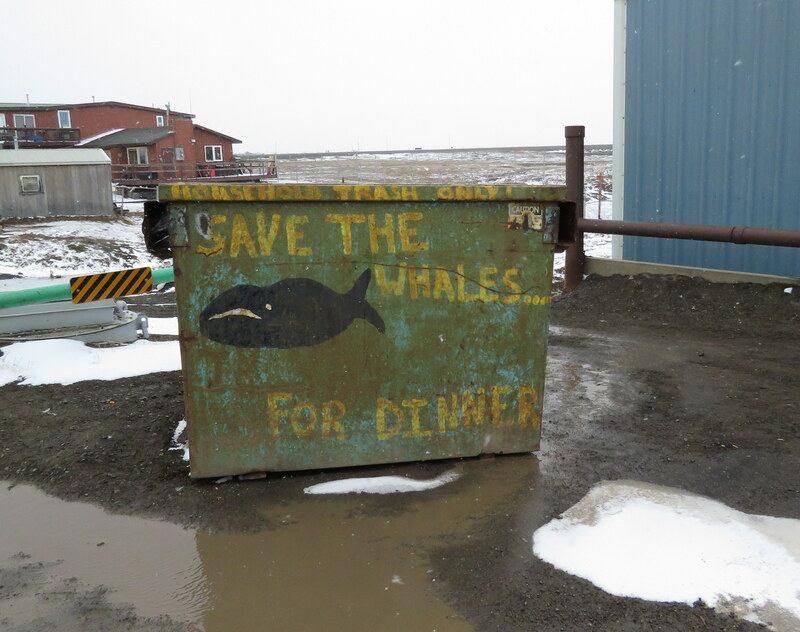 Many of the dumpsters, such as this one, are painted with messages. We did go to the local grocery store – Alaska Commercial – to find me a pair of gloves (I brought two left hand gloves) and sunglasses for Jack (snow glare). 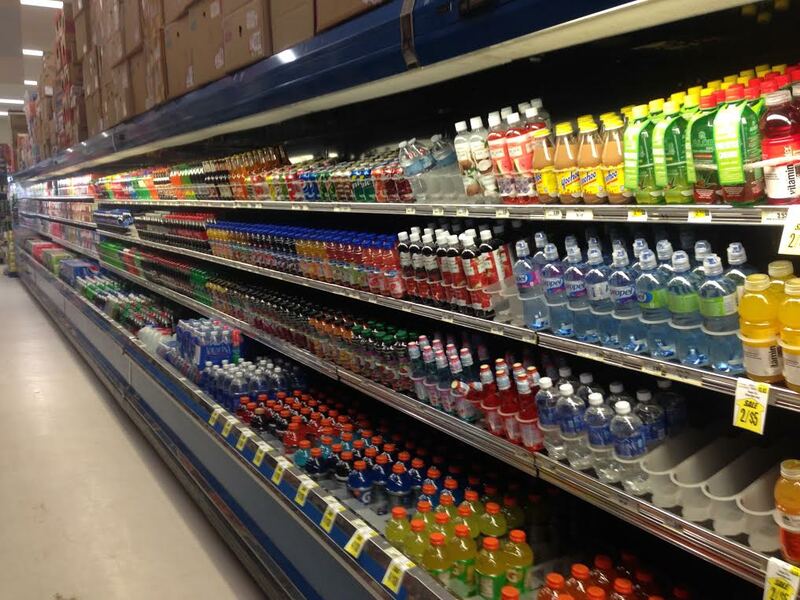 Of course one of the more popular isles is the sugary drinks section. 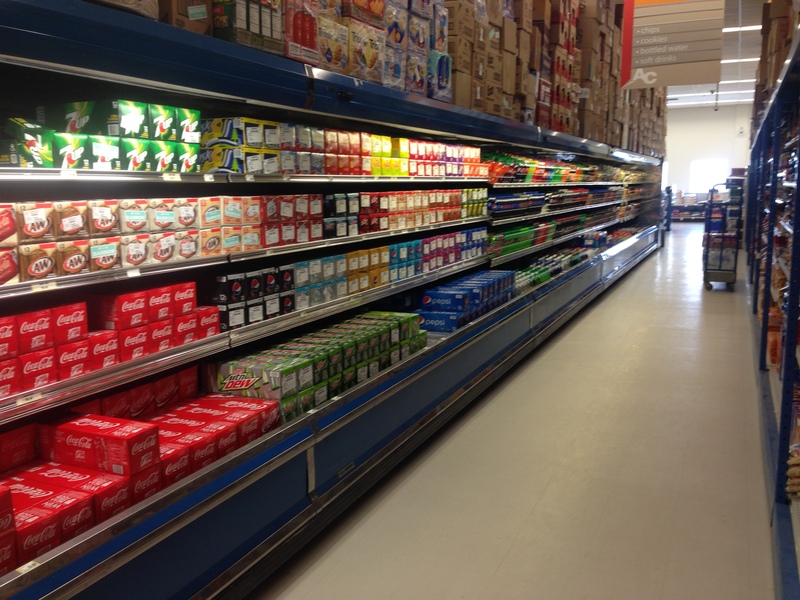 The sugar industry is why Americans and others around the world are overweight. Plus this stuff will rot your teeth. 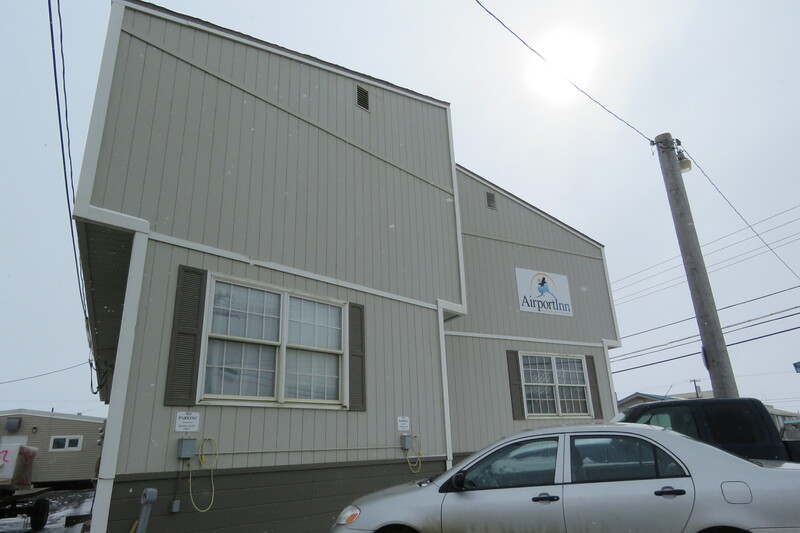 And we did see at least two dentist offices in town. 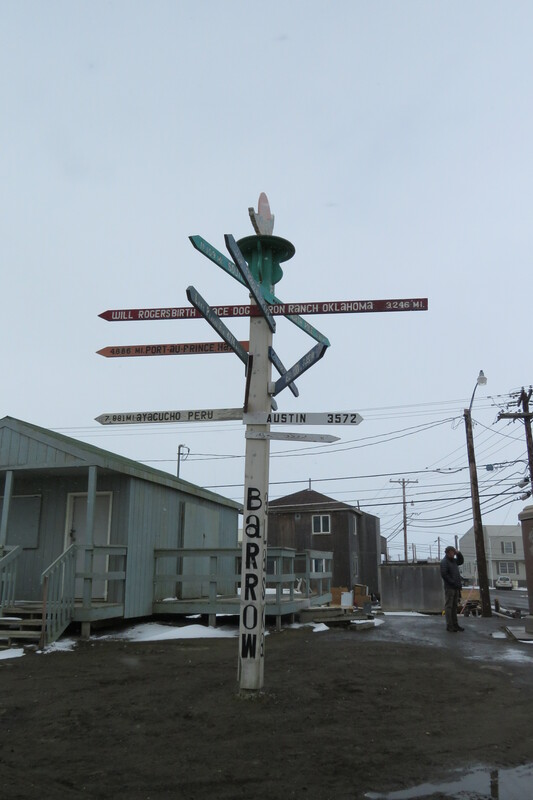 We had a great time in Barrow and would recommend the trip. It is wise to plan ahead as our fellow birder John said he just showed up and was told he was lucky he didn’t come next week because all the hotel rooms in Barrow were booked for bird tours and the like. We had booked our room back in January. 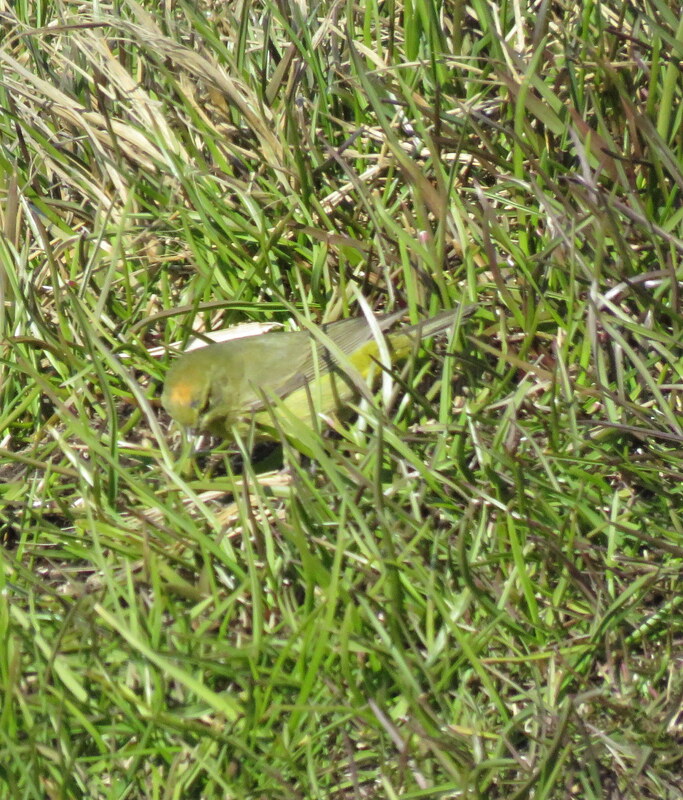 There were several independent birders (not those on tour) who were at the same hotel as us. Funny though, we didn’t really run into anyone else out birding while we were out and about – and there aren’t “that” many roads. 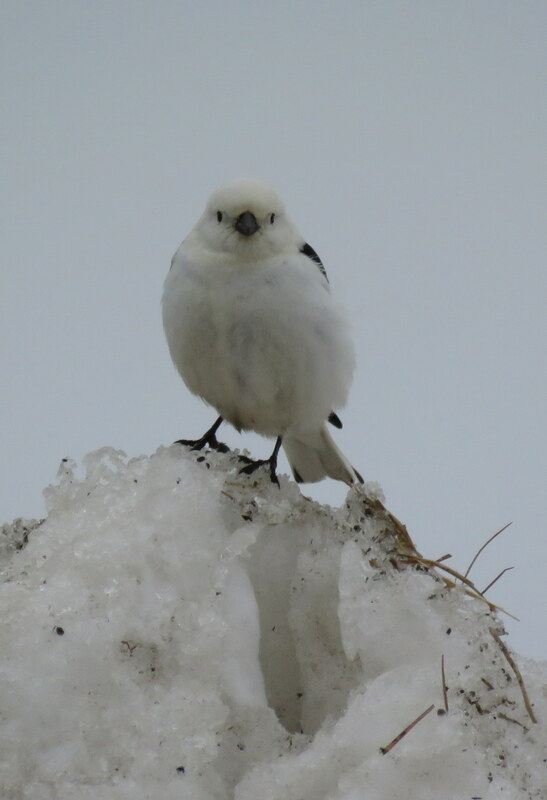 It’s A Great Day to Bird wherever you are …..